1. Your loved one lives alone and can no longer handle daily tasks. An aide who stops by for a few hours a day can help drive your loved one to the doctor and the store, do light work around the house and generally check up on things — all while providing social interaction. 2. Your loved one had an accident and requires around-the-clock care for a few weeks. A broken hip makes everything more difficult, but it shouldn’t be a one-way ticket into nursing care if your parent or loved lives alone and you can’t be there. 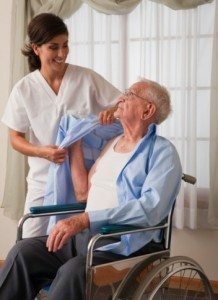 A live-in home health aide can stay with your parent or loved one through this tough time, helping him/her to the bathroom at any hour, cooking, cleaning and even keeping up with light medical care. 3. Your loved one is too prideful to accept help from family members — but is starting to need it. It’s hard enough for your loved one to admit to friends and family that s/he needs help using the bathroom. A live-in private home health aide lets your loved one maintain more dignity about these matters and go on living a normal life. 4. Your loved one’s memory is deteriorating or they have early onset of dementia. When a loved one’s memory is beginning to fade, or they have early onset Alzheimer’s or dementia, that does not mean they need around the clock care. They may need just a few hours a day. Until they get to a point where they need much more supervision, you can allow them their independence through a part time private home health aide or possibly a live in. When it comes down to it, both you and your loved one may be happier if you don’t take on the full-time caregiving role. Private home health aides help you maintain a healthy relationship with the parent or spouse who needs care. You can avoid building up resentment early on or compromise precious time you spend with your growing children this year. By hiring a home helper or respite care worker, you can ease your aging relative and yourself into a future which may require round-the-clock or long-term care.